In order to understand this problem, it is important to have done the previous exercises. 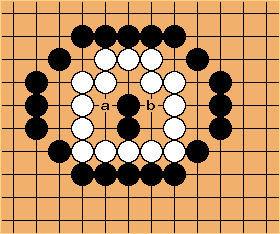 If White does nothing, then Black can almost fill with butterfly six? If White a and b then Black can still make a farmers hat. In conclusion, White is dead, and even has not a single ko threat to bring his group back to life.